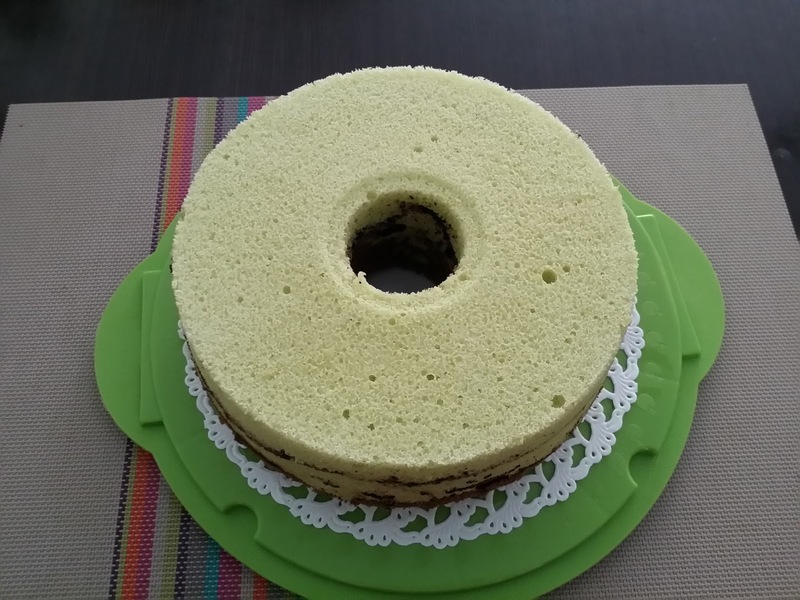 Here's my slightly modified version as I've tweaked the recipe a little to make a portion with chocolate flavour and created 2 cocoa lines for this chiffon cake. I've also heeded the advice from my baking 师父 (master) to whip the meringue first to save the hassle of washing and cleaning dry my electric stand mixer 2 times. 2) In a clean mixing bowl, whisk the cold egg whites and cream of tartar till foamy using the electric mixer. Gradually add in caster sugar in 3 separate additions and beat till stiff peak, formed into a firm meringue. Transfer to a big bowl and chill in the fridge. 3) In the same mixing bowl, cream together egg yolks and caster sugar until pale and thick using the electric mixer (about 3 - 4 minutes). Add vegetable oil and continue beating. 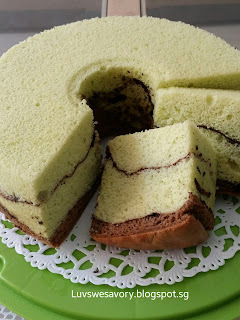 Once the oil has been incorporated, add coconut milk and pandan paste and mix well. 4) Next, add the sifted top flour and mix until just combined. Scoop about 1/3 of the batter and sift in 1 tablespoon cocoa powder, mix well. 5) Divide the meringue into 2 portions: about 1/3 for cocoa mixture and the remaining for pandan mixture. Gently fold meringue into the cocoa mixture with a spatula until it looks evenly mixed (no streaks of meringue). Gently fold 1/2 of the meringue into the pandan mixture with a spatula. 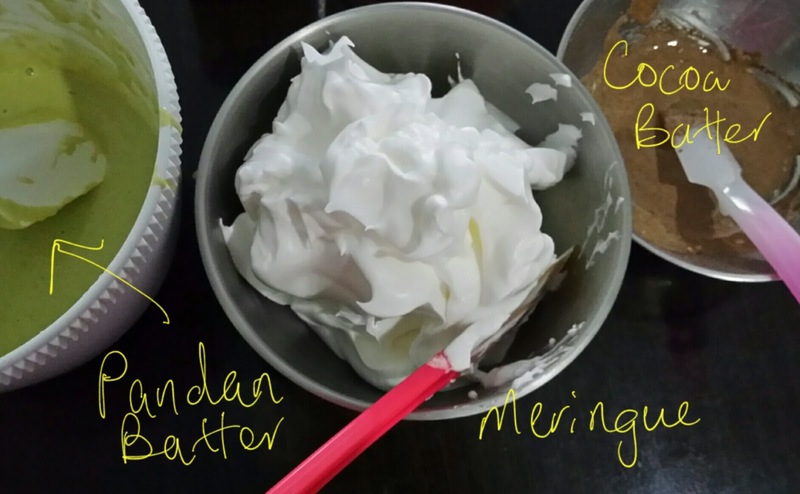 Fold the remaining meringue into the pandan mixture until it looks evenly mixed (no streaks of meringue). 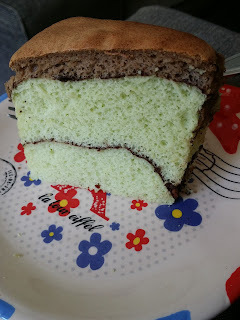 6) Pour 1 layer of pandan mixture in an un-greased chiffon tube pan. Level it with a spatula. Evenly dust a thin layer of cocoa powder over the batter (about 1.5 tablespoons). Repeat the same for 2nd layer of pandan mixture. Lastly, pour in the cocoa batter, level it with spatula. 7) Gently tap the pan on the table top a few times to release trapped air bubbles. 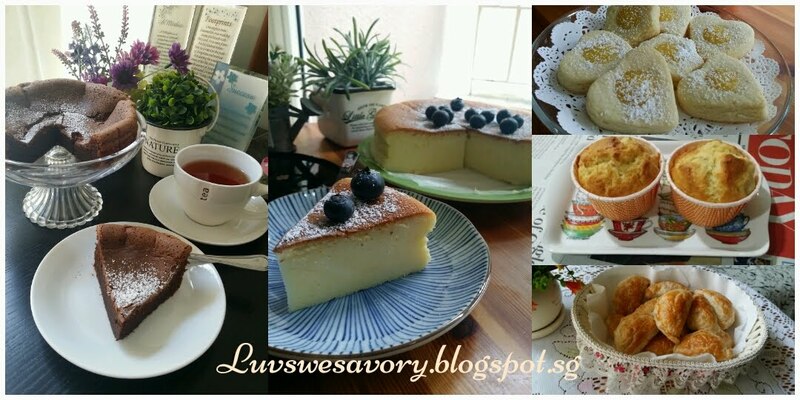 8) Bake at the preheated oven 180°C for 15 minutes. Then lower the temperature down to 160°C, continue to bake for 45 minutes or until the cake surface turns golden brown, and a skewer inserted into the centre comes out clean. I covered a piece of loose foil over the pan in the last 15 mins of baking to avoid cake top being burnt too much. 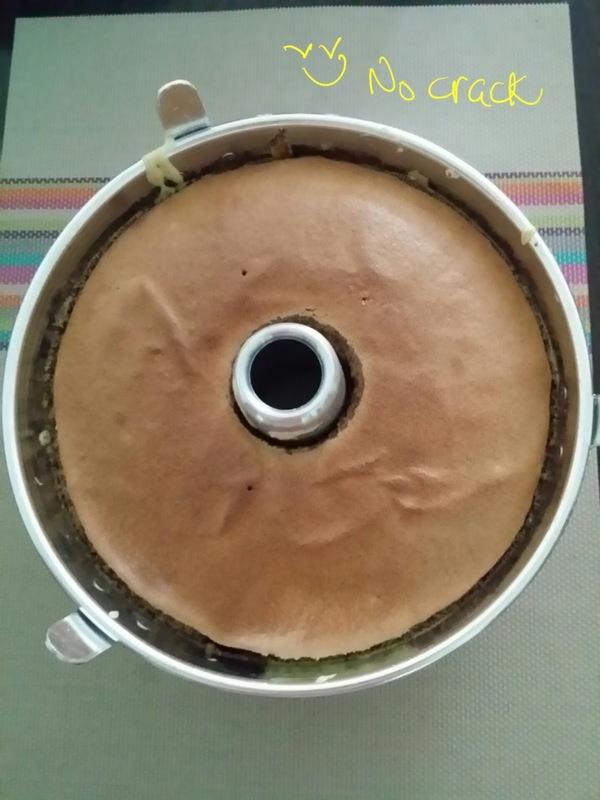 10) Immediately invert the pan to cool completely before unmoulding the cake from the pan. Enjoy ! 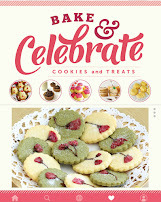 Happy baking ! Hi karen, this topo map pandan chiffon so nice ! 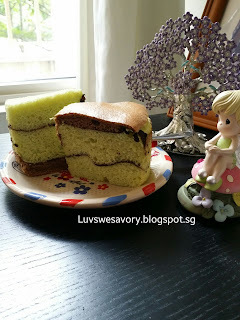 i am seeing pandan chiffon everywhere! all are so well baked including yours! 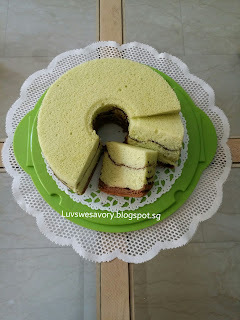 Very well baked chiffon cake and I am sure it tastes great too! 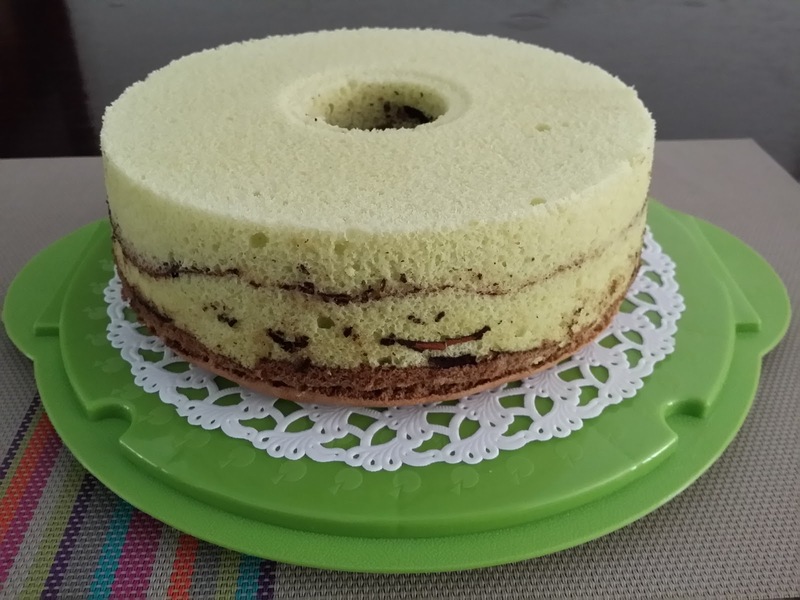 Hi Karen, I like your topo map style chiffon cake. Looks pretty! Hi Karen..I love your topo map chiffon..very pretty.. Your tweak have baked up a lovely topo map chiffon cake.